For many things in life – a stagnant project, a looming deadline – multiple minds are better than one. “Let’s put our heads together,” we say, “to solve this.” How? It begins, of course, by bringing people together. But tapping the collective wisdom of a group – a powerful, transformative potential – requires attention to the “structures” in which minds gather. We gather for brainstorming sessions, open discussions, presentations, debriefs and managed discussions. We seldom think of these as meeting structures because they’re the norm – conventional structures we are familiar with, just like the workweek, the speed limit, or the lecturing professor. We seldom question why a staff meeting revolves around someone making a PowerPoint presentation and taking questions at the end. Our boss tries to generate ideas simply by asking everyone in the room what they think. We are so used to these structures that we don’t even notice them, or consider alternatives. Then, when such gatherings fail to create space for good ideas to emerge or there’s no follow-up, we do ask questions – and often point fingers. We may want to blame our boss’s leadership style, the talker in the room, or the quiet person in the back who “failed” to contribute. Sometimes we write off collaboration altogether. But what about the structure? How does the way we meet contributing to the undesired outcomes we get? We can meet in ways that include and engage everyone in the room, that unleash ideas we’d never have thought of ourselves, and that generate action that leads to better results. They don’t require a professional facilitator – just intention in how we design our gatherings and a willingness to risk doing things differently. Keith McCandless, a founding partner of the Social Invention Group who formerly led executive learning initiatives for the Health Forum, and Henri Lipmanowicz, former president of Merck’s Intercontinental Region and Japan, have been working together since 2002 to develop alternative meeting structures anyone can use. Through their collaborative work, they have developed 33 “microstructures.” These are based on simple rules to replace or supplement conventional meeting structures and enhance the coordination of groups of people. They call them Liberating Structures. A community of people worldwide is integrating these Liberating Structures into their work – in college classrooms, hospitals, trainings and meetings. Some even use them with their families and friends. And they’re noticing tremendous results. Use “play” and fun to help clear the way for innovation. Identify the purpose people are meeting. This serves as guidepost for deciding how to meet or whether there should be a meeting at all. 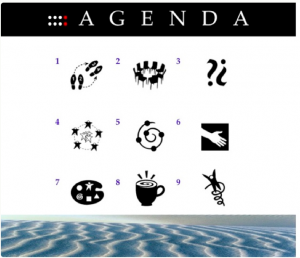 Break down hierarchy and power dynamics to unleash the creativity of all participants. Relinquish control of what is said – be surprised by the outcomes. A simple structure to start with is “1-2-4-All.” I have used this many times and settings, including a recent strategic planning meeting whose purpose was to develop a clear direction, along with concrete projects, for a new group of NGO workers who wanted to collaborate on grassroots advocacy. We asked everyone to consider a prompt: first, by themselves for a minute, then in pairs with each person sharing their responses, and then in fours, with each person sharing what their partner had told them. In fours, they were given another prompt and asked to share the best ideas that emerged. All the interactions had set time limits. This microstructure is simple, yet it yields very different results than asking a room full of people what they think or even just breaking a group into smaller ones. First, by asking everyone to consider the prompt silently for a moment, we created space for individual thoughts to evolve (particularly important for introverts). Then, by breaking people into pairs, we included everyone in the room: All were talking and listening (compare this to an open brainstorm, where a handful of people contribute all the ideas). By asking people to share what their partner had told them, we built trust, allowed for people to hear how their ideas were interpreted, and affirmed ideas. Finally, by putting the groups of four to work, ideas were sifted, iterations occurred and ultimately we got rich results. How Can Liberating Structures Change Outcomes? Start by observing interactions when you gather with two or more people. It could be an informal gathering of friends, a presentation, a planning meeting. Ask yourself: Who’s talking? Who’s not? Are people listening? How do I feel? What was created in the gathering (e.g., hurt feelings, new ideas, connections between people)? Ask yourself: “So what?” Why does it matter that only two people talked? Why does it matter that I felt or did not feel comfortable enough to contribute my ideas? In other words, how did those observable facts change what was created in the gathering? Imagine alternatives. What would have happened if some of these observable facts were different? What if time had been used more effectively or the introvert in the room had said what he was thinking? How could we have altered the structure of the meeting to create alternative outcomes? If you don’t like the answers, or even if you do but think there is space for improvement, try a Liberating Structure next time. Changing meeting outcomes simply takes a belief in the power of putting our minds together, and the guts to try something liberating. 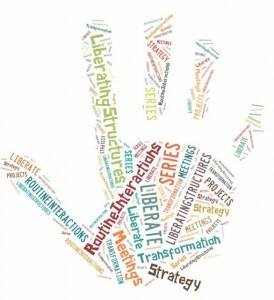 Liberating Structures website. And here’s a “getting started” guide. Erin Stock is a Washington, D.C., based communications specialist and graduate of The Clinton School of Public Service where she studied Liberating Structures.